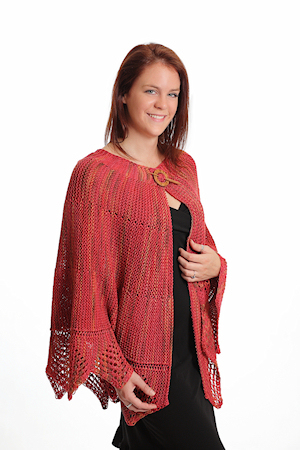 As the chill of Autumn nights sets in this shawl will keep you nice and toasty. This semi-circular design will stay on your shoulders better than your average shawl. Worked in Brooks Farm Yarn Four Play this becomes a real utility wrap,. January Hill is written in two sizes, 20″ or 24″ neck size. The 20″ size will just meet at the front, the 24″ size will allow for overlap. Requires 1000 – 1200 yds of worsted weight yarn and size 10 circular needles.